Should the Oilers Trade Nail Yakupov? | Five Minutes For Fighting Five Minutes For Fighting: Should the Oilers Trade Nail Yakupov? Should the Oilers Trade Nail Yakupov? In 1991, the Quebec Nordiques had the privilege of drafting first overall for the third straight year, giving them the chance to draft Eric Lindros, dubbed the next Wayne Gretzky. Lindros, however, had other plans, refusing to play in Quebec and holding out until being traded to Philadelphia the next season. Flash-forward 20 years and the Edmonton Oilers own the first overall pick for the third consecutive year. Like the Nordiques before them, they too might see that pick slip away, albeit for entirely different reasons. The Oilers are in a unique predicament this year: they have spent the last few years drafting high-end forwards and lack the same quality of talent on the backend. Although Edmonton’s system does possess a good amount of NHL-calibre defenemen, there is not a No. 1 quality blueliner among them. The Oilers have a choice: continue to add up front, which is almost entirely unnecessary, or deal the pick to add much-needed pieces to the blueline. Although this draft class is full of defencemen, the first few picks will likely be forwards. This means that the Oilers can trade down, possibly as low as five, and still have a chance to take the best defenceman in the draft. By trading down the Oilers would also be able to grab a young player and/or a handful of picks from a team eager to land Nail Yakupov, the highly skilled Russian winger from the OHL. This is an opportunity for the team to fill their greatest need, and at the same time add more pieces to their growing cupboard. It isn’t every year that a team is willing to trade away the first overall pick, and the return varies based on the needs of the teams involved. But we can look back at some of the teams that have traded the No. 1 pick to see what type of return the Oilers can expect and whether it is in their best interest to pass on Yakupov. In the past 20 years, the first overall pick has been traded only four times, and two of those times were in one year. The most recent year was 2003, when the Florida Panthers traded the first overall pick, along with a third-round pick (73), to the Pittsburgh Penguins for the third overall pick and a second-round pick (55). The Penguins dropped 18 spots, from the second round to the third round, in order to move up two spots and select Marc-Andre Fleury first overall. The Panthers selected Nathan Horton after Carolina took Eric Staal second. That was actually the second consecutive year that the Panthers dealt the first-overall pick. In 2002 the Panthers dealt the No. 1 pick to the Columbus Blue Jackets for the option to swap first-round picks the following year. This didn’t work out for the Panthers as they finished with the highest pick in 2003. Plus, the Panthers had to give the Thrashers their 2002 third-round pick and 2003 fourth-round pick for the promise not to select Jay Bouwmeester second overall. In essence, they paid to move down in the draft. In both cases the Panthers were better off keeping the pick and selecting the player they wanted. The other instance where the first overall pick was dealt was in 1999, when Brian Burke pulled off a complicated series of moves to land the Sedin twins. The Canucks already owned the third overall pick and then traded Bryan McCabe and a 2000 first-round pick to Chicago for the fourth overall pick. McCabe was a former second-round pick, had just turned 24, and had already completed his fourth year in the NHL. He was well thought of, so much so that the Islanders had already made him a captain early in his career, making this a fairly substantial package. Burke then sent the fourth overall pick plus two third-round picks (75 and 88) to the Lightning for the No. 1 pick. Needing assurance that Atlanta wouldn’t take a Sedin at No. 2, Burke dealt the first overall pick to the Thrashers for the second overall pick and a third-round pick (67) and the promise not to take either Sedin. In sum, teams dealing the first overall pick aren’t really getting as much in return as you’d expect. In one case they turn a third-round pick into a second and in other cases they just add third-round picks. This isn’t really the type of return the Oilers need. The Oilers need young players already established as NHLers or, at the very least, prospects ready to make an immediate jump into the NHL. If history is any indication, teams aren’t willing to add those players to deals for the first overall pick if they are already including their lottery pick. This is probably because in the years that the first overall pick is available the difference between the top few players is fairly marginal. Furthermore, when teams simply trade into the lottery and are forced to give up their own first-round pick from that year’s entry draft, only two deals in the past 20 years have had position players involved. In 1993, the Whalers dealt a 35-year-old Sergei Makarov, a second-round pick (45), third-round pick (58), and the sixth overall pick to the Sharks for the second overall pick. That pick turned into Chris Pronger, not too shabby for the Whalers. This certainly isn’t the type of deal for the Oilers to pursue. A couple of later picks and a declining veteran aren’t that great of a return for a high lottery pick. However, something that would interest the Oilers more would be a deal between the Rangers and Lightning in 1999. New York dealt Dan Cloutier, Niklas Sundstrom, a 2000 third-round pick, and the eighth overall pick to Tampa Bay for the fourth overall pick. Wait! Here me out. Cloutier was young and a former first-round pick who just finished a year backing up Mike Richter as a 22-year-old, posting a .914 save percentage. Sundstrom had just turned 24, was a former eighth overall pick, and broke 40-points for the second straight season. It may sound funny now, but these are the types of young, talented players the Oilers need to go after. Yes, at one time Dan Cloutier was considered talented. Of course, neither Cloutier or Sundstrom turned out to have successful careers, but at the time they were a good return for a team trading out of the lottery. If the Oilers trade down they have to do so for players, not picks. Another deal that might make more sense is something akin to Vancouver packaging Bryan McCabe with a first-round pick to obtain the fourth overall pick. McCabe was added instead of some picks because Vancouver’s 2000 first-round pick had risk associated with it; Vancouver could have conceivably won the Stanley Cup and given the Hawks the 30th overall pick. That’s why the Hawks needed a little more compensation than just a few third round picks. Ultimately, the Hawks ended up receiving the 11th overall pick the next year, which basically amounts to trading down seven spots. If the Oilers are willing to deal Yakupov for a team's first round pick in 2013, they would be able to pry a really good player away. This type of deal would be extremely risky for the Oilers, however, as the chances of them getting a pick back as good as the one they dealt is minimal. Or maybe the Oilers aren't even concerned with receiving a first-round pick in return, provided the package coming to Edmonton is substantial. There are some rumours floating around that the Oilers might take a run at Jordan Staal, provided that he is, in fact, available, and willing to sign a long-term extension. Without demanding a first-round pick coming back to Edmonton the quality of NHL player they receive back could be tremendous. So what type of return can the Oilers realistically expect for the right to draft Nail Yakupov? Traditionally, teams in the lottery don’t give up too much in addition to their own lottery pick, so the Oilers might not have a trading partner with another high pick to deal. 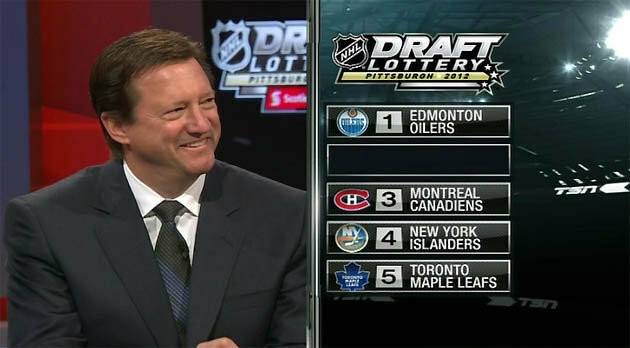 If the Oilers trade their way out of a lottery spot there might be a better chance of landing a young player already in the NHL. But if they do insist on taking back a lottery pick, there is one team that might have the need and the resources to oblige. That team would be the Toronto Maple Leafs. Brian Burke may be desperate to make a splash on draft day to help fans forget about the disastrous end to the regular season and buy himself a little more time. The heat is on Burke to make the playoffs after the ACC showed life for the first time in months to chant for the GM’s dismissal at the end of last season. Bringing home Yakupov from the draft might keep the wolves at bay, while at the same time improving the Leafs substantially. The Leafs also have a surplus of defenceman that might interest the Oilers, so a deal that combines a young defenceman, the fifth overall pick, and maybe something in the second or third round might pry the top prize from Edmonton. If Edmonton cannot find a team willing to part with young players, they are better served holding onto the first overall pick and selecting Yakupov themselves. It might not fill an immediate need, but nobody ever complained about too much scoring. Was a good read. What about trading the first pick for an already established NHL defenseman? Thank you. I think if the Oilers are to trade it, the return should be at least an established defenceman since they are giving up a potential premier talent. The established defenceman has to be young, of course, to fit in with age of the rest of the core. Even trading for an NHL-ready defenceman is a little dicey unless he's a can't-miss type prospect. Same anon as asked the above question. So I'm just basing this off the fact you're a writer and have an encylopedia-like knowledge of rosters, but would you happen to have any potential established d-men that would be possible trades? Say a Weber or the like? Is that a likely scenario too? Well, since you appealed to my vanity, ok. There is no way they can get a legit No. 1 like Weber for Yakupov. Even if they could, Weber is a UFA in a year and the Oilers need to have a guy they own the rights to for at least 3-4 years. The type of player they could try to get is someone like Cam Fowler on Anaheim, or maybe even John Carlson on Washington. But that might be a stretch as Fowler put up 40 points as a teenager and Carlson is pretty much already a No. 1. Regardless, those are the type of guys the conversation will likely surround.